2-day orientation to the RPs at the District ele3ve at the DIETs of the Erstwhile 10 district form 2-4-18 to 3-4-18 was conducted. In continuation of a above 2day orientation to teachers at the Divisional/mandal level duly allowing one day for planning meeting at hte DIET level training only for teachers identified to work as RO for the next level trianing was planned from 6-4-18 to 7-4-18 which was not completed. in this connection it is schedule to conduct the postponed divisional/mandal level training to teachers working in paralled english medium sections at primary level from 24-07-2018 to 25-07-2018. Accordingly, the present schedule of a 2-day Orientation to Resource Persons at the District level at the DIETs of the erstwhile 10 districts in the State and a 2-day Orientation to Teachers (for teachers teaching in English Medium sections opened during 2016 – 17 only, is planned at the District / Divisional level. A one day planning meeting at the DIET level training is permitted only for teachers identified to work as Resource Persons for the next level training, as furnished in the above given table. 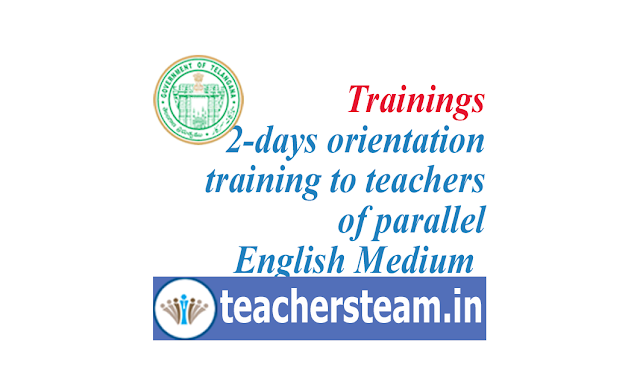 In order to maintain quality of the training, and also the quality of interactions, the training is planned for 30 to 35/36 teachers only at both the levels and the number of RPs is also taken at 1: 30 to 35/36 teachers for the training. Teachers who have been identified to works as Resource Persons will go to DIETs of their respective erstwhile districts for district level training. The District Educational Officers and E.O: Project Officers of SSA and the Principals of the DIETs concerned in the State are requested to follow the guidelines given for conduct of the said training programme both at DIET and district/divisional level training. The details of the district-wise estimated budgets are enclosed. Further, the Principals of the DIETs concerned are requested to furnish the expenditure statement, UCs, and balance amounts to the DPOs of the SSA of the districts concerned from where the amounts for the said trainings are released, soon after the completion of the training at the DIET level. The Sectoral Officers / Incharge Sectoral Officers – II of the districts concerned have to coordinate with CDs for an effective conduct of the trainings and to capture data on the same for submission to SPO.